Soccer players and coaches alike admire the German national team for their combination of individual qualities and teamwork, leading to some of the most creative soccer being played during the 2014 World Championship. The roots for the German teams success can be found in the youth training practiced in German soccer clubs. Most professional soccer clubs in Germany have their own youth academy where the next Bundesliga stars are formed. Of the 2014 World Cup squad, only Miroslav Klose was not trained in one of these academies. 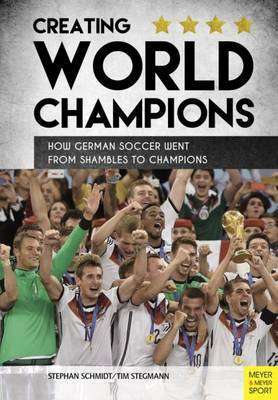 In this book, the system used for German soccer youth development is explained with particular emphasis on the different paths that young players can take on the road to success. World Champions and rising star players present their individual stories and some of the exercises that improve their strengths and remove their weaknesses. This book contains many interviews with former Bundesliga stars, soccer experts, and youth and professional coaches as well as an overview of the youth development program of an ambitious amateur club. Some of the star players interviewed include Marco Reus, Manuel Neuer, and Shkodran Mustafi as well as rising stars Sebastian Rode and Maximilian Arnold. This book is for everyone whos interested in the German Soccer Associations talent nurturing and different perspectives on the preparation of young players for a professional soccer career.